Endeavour will be available for public viewing Sept. 19 until 9 p.m. Endeavour will depart Ellington at sunrise Sept. 20 to continue on its way to Los Angeles for permanent display. Today, the SCA/Endeavour combo is planned to fly approximately 1,500 feet above various areas of Houston, Clear Lake and Galveston – including JSC — between about 9 and 10:30 a.m. as it arrives in Houston from the Kennedy Space Center (KSC). Endeavour’s Landing at Ellington is set for about 10:45 a.m. The specific route and timing of Endeavour’s flight will depend on weather and operational constraints. After landing at Ellington, Endeavour will come to a stop near the NASA Hangar 990 pedestrian gate. The public will be able to view the aircraft and Endeavour from as close as 100 feet away starting about 30 minutes after it is parked. Public viewing will continue until 9 p.m. Wednesday. Endeavour’s departure from Ellington is planned for about sunrise on Thursday, Sept. 20. JSC civil service employees are encouraged to participate in this NASA-sponsored activity as recognition for your many contributions to the Space Shuttle Program and incentive for safely and successfully furthering NASA’s mission. Participation during your normal duty hours is considered work time recordable to your normal charge codes. This includes transit time between Ellington and your regular work site using a reasonably direct route. You must coordinate with your supervisor to discuss which day and hours are acceptable for participation, while ensuring that work deadlines and organizational objectives remain supported without resulting in overtime, premium pay, comp or credit time. JSC contractors are asked to check with their own company’s policy. Employees and the general public may park at Ellington Field to witness the landing, view the shuttle or watch the takeoff (approximately 7 a.m. on Sept. 20). Please note: Hangar 990 itself will NOT be open to employees or the public during the viewing days. The American Institute of Aeronautics and Astronautics (AIAA) Houston Section Horizons July / August 2012 newsletter (76 pages) is now available in low and high resolution formats. Cover story: Ring Wing Waveriders by Dr. Patrick E. Rodi. Also on the cover: Man Will Conquer Space Soon! 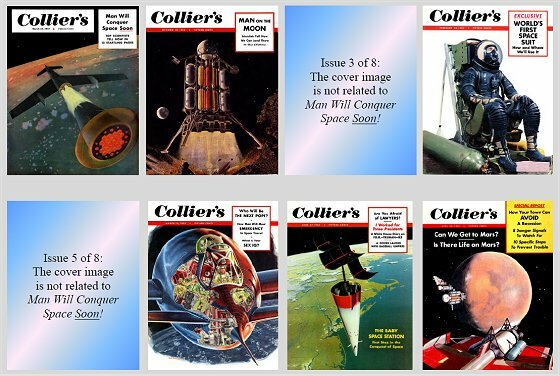 This is from the weekly magazine Collier’s, from the March 22, 1952 issue (25 pages), by Dr. Wernher von Braun, Chesley Bonestell, and many others. Ellington Field Joint Reserve Base by Colonel Jack “Stitch” Daniel, Commander. The 100 Year Starship Public Symposium in Houston, September 13-16, 2012. The Scientific Preparatory Academy for Cosmic Explorers (SPACE) Inaugural Event, by Shen Ge. Suddenly Tomorrow Came… A History of JSC, the Audiobook. Recent conference papers by Section members, and much more. We will also be interviewing candidates for appointed positions for next year’s AIAA Houston Executive Council very soon. If you are interested and would like to be considered for any of positions with a red border or without any border on the 2011-2012 org chart, please contact the chair, Daniel Nobles, at chair2012[at]aiaahouston.org. Congratulations to all! The 2012-2013 year will be another fantastic year with these leaders serving the council! 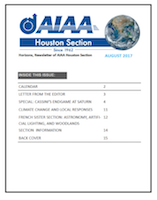 The AIAA Houston Section is proud to present its latest issues – including a special edition highlighting the section’s 50th Anniversary gala – of Horizons, the award-winning bi-monthly newsletter publication. Please join us in honoring fellow AIAA Houston Section members that are celebrating their 25th, 40th, 50th, and even 60th anniversary as AIAA members! We will also be recognizing outstanding members that have gone above and beyond to enrich our section’s programs and technical endeavors. Come meet the 2012-2013 AIAA Houston Section Council! AIAA-Houston will also be presenting a charitable donation to the Challenger Center from Yuri’s Night’s proceeds. Details on how and when to RSVP will follow. We look forward to seeing you there! Nicolaus A. Radford currently works for National Aeronautics and Space Administration at the Johnson Space Center in Houston, Texas in the Dexterous Robotics Laboratory. He serves as the Deputy Project Manager and Chief Electrical Engineer for NASA’s Robonaut 2, an anthropomorphic humanoid robot. He is also the Principal Investigator for NASA in DARPA-funded advanced electric machine research for robotics. He also leads NASA efforts in exoskeleton research for crew exercise and mobility assistance. He specializes in inverter design for brushless DC motor control. He graduated with a B.S.E.E. (’00) and a M.S.E.E (’12) from Purdue University and is currently pursuing a PhD absentia with Dr. Steven Pekarek in Optimal Design of Variable Flux Permanent Magnet Synchronous Machines at Purdue also. Migration of the data from the old website to this site is coming along steadily. What you see now is not the final product. Stay tuned for a new look and feel and more updated content (especially under the Technical Committee page).